Yehudi Mercado seems to go about a zillion miles an hour. You could get that impression from a single page of his comics, which swell with color, exaggerated facial expressions, background detail and swooshy line. Or you could get it from his frequently updated website. Or from his résumé, rich with not only comics but also animation. His work caught my eye with Pantalones, TX, a few years ago, but then I stopped paying attention. That was my mistake! He’s done plenty in the meantime, and his newest project, Sci-Fu, a fluorescent all-ages hip-hop space opera comic book, is lot of fun. Just out from Oni Press, it smooshes the sometimes insular worlds of rap, comics, martial arts movies and sci-fi into a Venn diagram that shows you just how much overlap they share. Mercado answered my questions over email, including how his early career as a pizza delivery guy helped his comics career. Paste: So you started out as a pizza delivery guy, right? How’d you get from there to being a professional comics artist and writer? Did you go to school for it? Yehudi Mercado: I delivered pizza during summers in college. It was the inspiration for my first graphic novel, Buffalo Speedway. I always thought the job of delivering pizzas was the perfect metaphor for your 20s. You’re spinning your wheels, driving hundreds of miles, but still going nowhere. I went to the University of Texas at Austin for Fine Arts. I took animation and commercial art classes at Austin Community College where I was scouted by a local videogame company. I had a full-time job doing character designs and animation before I even graduated college. When I was at that company I created an original game that Hasbro wanted to make into a Playstation game. That was my first taste of artistic validation. But the game was eventually canceled, which was my first taste of professional heartbreak. Paste: Do you feel like you learned anything from delivering pizza that you can apply to your current career? Mercado: Delivering pizzas provided a lot of alone time in the car. It gave me a lot of time to come up with story ideas. I remember going to a talk with Mike Judge where he said that a manual labor job allowed your mind to drift and think, rather than a boring office job that kind of occupied your mind. Paste: I’m going to assume that you spent a lot of time drawing as a kid, right? What was your favorite stuff to draw? Mercado: I was drawing constantly. My father is an architect and a painter so I always had access to art supplies. And my mother helped create the department of technology at the Houston Independent School District, so we always had the latest in computers and even tools to draw on the computer. I always loved drawing cartoon-y superheroes. I think my love of ‘80s action movies and The Tick were my main inspirations. Paste: It also seems like you were really invested in making up your own narratives from an early age. Do you prefer projects where you get to draw and write? Mercado: I do! I definitely try to make projects that I want to read as a fan, ideas that I feel are missing in the marketplace. It’s completely selfish on my part. I do love getting to write and draw my own worlds. Rocket Salvage is a project I wrote and an artist from Mexico named Bachan drew. That was amazing, to see someone run with my concepts. I would love to have an ongoing series that I only wrote. I would love to take an existing property and give it the old Yehudi twist, like what Ryan North did for The Unbeatable Squirrel Girl. Paste: Are you a big fan of Ed Piskor’s Hip Hop Family Tree? Mercado: Oh yeah. I love it so much. It feels like it was only made for me, it’s beautiful. If we ever do a deluxe hardcover edition, I would love for Ed to do a mini backup story. Paste: Did you grow up in Austin? And how did you encounter hip hop there? From the radio? From “Yo! MTV Raps”? Mercado: I grew up in Houston, then lived in Austin for a long time. Houston has a great hip hop history. But, yeah, I mainly learned what hip hop to listen to from older kids and MTV. I remember seeing the music video for Run-DMC’s “Walk This Way” and it blew my mind, and I had no idea who Aerosmith was! For the longest time I thought it was nice of Run-DMC to help this up-and-coming rock band. Paste: Did you write your own rap lyrics as a kid? Mercado: I mainly wrote spoofs. I was also a huge fan of Weird Al Yankovic. I would try and write my own parody songs. I did one for Michael Jackson’s “Thriller” about “Miller (Beer)”. In high school, my friends and I wrote a three-act musical comedy about a Chinese restaurant. All the songs were parodies of Broadway hits. Paste: This book also functions like a rap opera because so much of it is delivered through music. True or false? Mercado: True! My dream would be to see this fully animated. 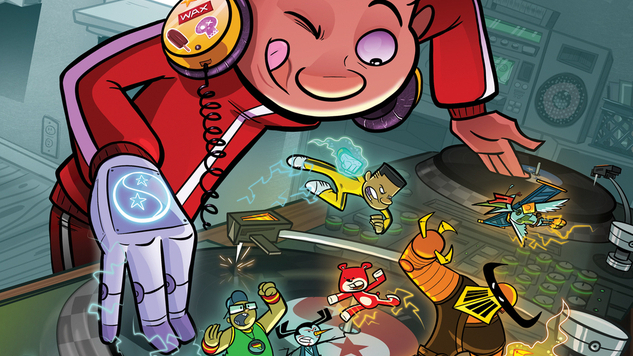 The world needs a hip hop, sci-fi, kung fu, family-friendly musical! I always try and weave music into all my books. Buffalo Speedway had a playlist of songs for each chapter. Pantalones, TX started with a Jerry Reed-style country jam. Paste: What’s your drawing process like? Analog? Digital? Neat workstation? Pizza boxes everywhere? Music on or off? Mercado: I lay out my books in Adobe Animate (formerly Flash) because I like to see my pages on a timeline that I can flip through. It really helps me with pacing. I now ink on the iPad Pro using an app called Procreate. I like working digitally. I think it’s because of my animation background. I am always in a cluttered space. As a kid, before I started drawing, I would spread out all my comic books on floor as inspiration. Paste: You seem to have gravitated toward all-ages comics. Why do you think that is? Mercado: My style lends itself to a cartoonier look. Buffalo Speedway is a more R-rated book and I always felt bad about pushing kids away from my table at comic conventions. Paste: Pirate Polly isn’t the first character you’ve created who has an eyepatch. Is that a Nick Fury thing? Or do they just look super cool? Mercado: In Hero Hotel I have couple of pages making fun of Marvel’s cameos/post-credits scene with a character named Stanlee L. Jackson. He looks like Nick Fury with Stan Lee’s mustache and glasses. In Rocket Salvage, the character Beta has an eye patch because he’s basically been used for spare parts. For Pirate Polly in Sci-Fu, it’s a little homage to hip hop legend Slick Rick.